After decades of negotiations, the Nagoya Protocol on Access and Benefit-Sharing entered into force on Sunday, enhancing opportunities for the equitable sharing of benefits of the world’s biodiversity. The Protocol, named after the Japanese city where it was agreed in 2010, establishes clear rules for accessing, trading, sharing and monitoring the use of the world’s genetic resources that can be used for pharmaceutical, agricultural and cosmetic purposes. By establishing this framework, the Protocol, which falls under the United Nations Convention on Biological Diversity (CBD), seeks to ensure that genetic resources are not used without the prior consent of the countries that provide them, and that the communities that possess the traditional knowledge associated with the use of these resources also enjoy the benefits of sharing them with the rest of the world. However, 50 Parties to the CBD had to ratify before it could enter into force. The Protocol received its final necessary ratification on 14 July 2014. It now has 54 ratifications. “The Protocol essentially offers countries a framework that allows them to regulate the access to their genetic resources and at the same time decide under which conditions this access will take place, and what benefits they will get from it,” said Viviana Figueroa, CBD Associate Programme Officer. Benefits received in exchange for access to genetic resources can be monetary or non-monetary, including, for instance, technology transfer, joint research or capacity-building activities. Establishing a clear path from the discovery of a genetic resource all the way to its commercialization can be a tricky and comprehensive legal process, one that involves various governments, local authorities, businesses and indigenous communities. The Protocol seeks to reduce uncertainty in this entire process by setting transparent and fair conditions throughout the whole value chain. “On the one hand, many regions are rich in biodiversity and are therefore rich in genetic resources and traditional knowledge,” Ms. Figueroa explained in an interview with the UN News Centre. “This is the case of Latin America, Africa and the Pacific. On the other hand, more developed countries have the technology but not the genetic resources or traditional knowledge, which they need to access to develop new products such as medicine, food, etc. All of this requires a structured process with clear relationships between supplier and consumer countries.” For example, the healers of the indigenous Maori in the Cook Islands possess a wide range of traditional medicinal knowledge, including applications for various plants such as the arnebia auchroma and hibiscus esculentus which are useful in the treatment of bone fractures and skin afflictions. If a researcher wanted to further investigate and commercialize these genetic resources he/she would have to follow a number of procedures including obtaining consent from indigenous communities and the Government to use these plants. From the point of view of the indigenous group, they possess the traditional knowledge on this resource and are therefore entitled to benefits from its sharing and trading. The Cook Islands Government would also seek to ensure that it benefits from resources found in its territory. In this case, Dr. Graham Matheson, a national of the Cook Islands, consulted both the Government and the Koutu Nui before doing further research into these plants in 2003. The parties successfully reached a benefit-sharing agreement and an incorporated company was created, with Mr. Matheson and the Koutu Nui equal shareholders. But indigenous communities are not always involved in negotiations from the start and many times they may not even know that they are entitled to benefits derived from their knowledge. Before the Nagoya Protocol there was no overarching international framework to document the use of genetic resources, and it is hoped that with its implementation there will be more legal certainty and transparency when researchers approach countries about using their genetic resources for various purposes. “The Nagoya Protocol is the first international instrument to recognize that indigenous and local communities have the right to receive benefits from the resources found in their lands and knowledge that they have about these,” said Maria Eugenia Choque Quispe, from the Aymara people in Bolivia, who is also an Expert Member on the UN Permanent Forum on Indigenous Issues . Ms. Quispe, along with many other representatives of indigenous communities around the world, was involved throughout the negotiations of the Nagoya Protocol, and sees the agreement as an instrument to empower indigenous people. “Indigenous communities have been key to the Nagoya Protocol, and no other instrument gives them as much rights as this one,” said Ms. Figueroa, who, with CBD, travels to indigenous communities offering capacity-building workshops for indigenous communities in which their rights regarding genetic resources are explained. By helping to ensure fair benefit-sharing, the Nagoya Protocol will also create incentives to conserve and sustainably use genetic resources, increasing the contribution of biodiversity to development and human well-being. “The implementation of the Nagoya Protocol represents a milestone not only for the Convention on Biological Diversity, but also in the history of global governance for sustainable development,” said Braulio Ferreira de Souza Dias, Executive Director of the Convention on Biodiversity, at the opening of the first meeting of the Parties of the Protocol, which is taking place concurrently with the 12th meeting of the Conference of the Parties to the CBD in Pyeongchang, Republic of Korea. “The sustainable use of biological diversity plays a key role in poverty eradication and environmental sustainability, thereby contributing to achieving the Millennium Development Goals,” he said, referring to the eight largely anti-poverty targets, which come due in 2015. One of the ways in which the Protocol seeks to increase transparency is through its Access Benefit-Sharing Clearing House (ABS-SH), which is an online platform for exchanging relevant information. Its goal is to enhance clarity on procedures for access as well as offering opportunities to connect users and providers of genetic resources and their associated traditional knowledge. With the Protocol entering into force, parties will be required to provide and regularly update information on the platform. Even though the Protocol has entered into force, it will take some time before it is fully operational, as many countries still need to implement national measures that comply with the accord’s terms of agreement. “There is an imbalance of knowledge between the North and South, so for example, African countries requested the German and Dutch governments at the time to support them in the negotiation phase,” said Suhel Al-Janabi, co-manager of the ABS- Capacity Development Initiative, which supports countries and stakeholders in developing national Access and Benefit Sharing systems. While the initiative began as a way to help developing countries in the Protocol negotiations, it has now drifted into providing support towards implementation. There are other details which are also essential such as finding out whether the genetic resource is also available in another country, and which terms of access and sharing have been established there. The ABS-Capacity Development Initiative, which is managed by the German Development Corporation, is working with many countries who are in the process of ratifying the Protocol – 52 have ratified it so far – but will not do so until they have their national measures in place. For example, it is currently working with Cameroon to develop an ABS agreement with a French company that is interested in using a plant in the country as an ingredient for perfumes. 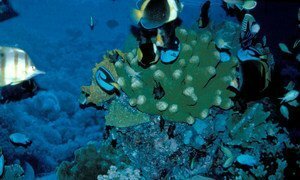 The global economy could be losing as much as $1 trillion annually by the end of the century if countries do not take urgent steps to stop ocean acidification, says a United Nations report launched today in Pyeongchang, Republic of Korea (ROK).